Dyna-Ski outboard powered water ski boats make excellent all around water ski boats If you want to pull little kids, teenagers or adults that slalom, barefoot, wake board, tube or just ski on a pair of water skis you can do it with a Dyna-Ski Boat. Dyna-Ski Boats can be easily fitted with barefoot booms, towers, extended pylons, fat sacs and just about anything else that water ski enthusiasts will come up with now and in the future. The new generation of outboard motors are very quiet, fuel and oil efficient making for a true affordable tournament style outboard powered boat that is quite a bit less expensive to purchase, operate and maintain than an inboard water ski boat. The outboard motor on a Dyna-Ski Boat can be tilted up allowing for operation in waters that inboard water ski boats could not operate in. Dyna-Ski Boats are much lighter than traditional inboard water ski boats making them easier to tow behind your vehicle, launch and retrieve from the lake. 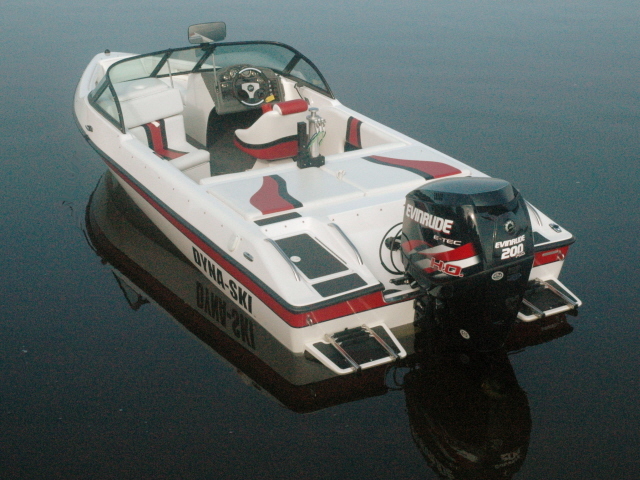 Dyna-Ski Outboards can be quickly and easily cleaned up from salt water usage again unlike an inboard water ski boat. There are outboard motor sales and service dealers all over the world so you can have your Dyna-Ski boat taken care of no matter where you are. We have satisfied customers all over the world including Moscow Russia, the Cayman Islands and Canada so even though there may not be a Dyna-Ski Dealer in your area you can still enjoy the best value in tournament water ski boats Dyna-Ski! Buying directly from the company means you will save money and get a boat that is optimized for water skiing. Since Dyna-Ski Boats have been shipped around the world we can get one to you. It should be comforting to know that you will never out grow your Dyna-Ski Boat. When outboard motor technology improves you can easily trade in just your old outboard motor from your Dyna-Ski Boat for a new motor saving the expense and hassle of selling your boat, motor and trailer to buy a new water ski boat. My family has had the same Hydrodyne outboard powered water ski boat since 1987 although we have upgraded the motors over the years as the motor technology improved. Hydrodyne Outboards was the line of boats that inspired Dyna-Ski. We have changed a lot of little things along the way but the basic simple functional design is still in use at Dyna-Ski. The options list for Dyna-Ski Boats seem to change with every new boat that we build. Generally speaking if you want it we can put it on your new Dyna-Ski Boat. Two stroke and four stroke motors all work just fine on our boats. Lately Dyna-Ski customers seem to prefer to purchase water ready packages although you can buy a boat & trailer from the factory and purchase your outboard motor locally if you prefer. Some customers are even keeping their old engine or trailer and just buying a new Dyna-Ski. The choice is yours. You will seldom see a used Dyna-Ski or Hydrodyne for sale as the owners tend to keep them in the family forever. I doubt that at any other boat company the owner will answer your questions and sell you your last boat. So please feel free to tell me what you are looking for and I'll give you specific information so you can buy your last boat. Visit the blog at www.dynaskiboats.com for more information, inside stories and pictures.